The whole turmeric is a tuberous rhizome, with a rough, segmented skin. The rhizome is yellowish-brown with a dull orange interior that looks bright yellow when powdered. Our high quality turmeric acts as a mild digestive, being aromatic, a stimulant and a carminative. An ointment base on the spice is used as an antiseptic, its water is used as a cosmetic applied to impart a golden glow to the complexion. Turmeric is used in food colouring, flavouring and in medicine and cosmetics. It also has religious ceremonial uses in the Indian culture. Curcumin, the active ingredient in turmeric is extensively researched for its ability to counteract cancer, We offer both whole and ground varieties of turmeric. 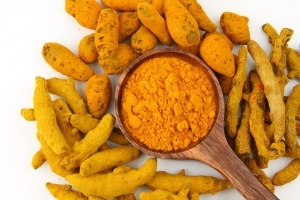 We have carved a niche as a supplier of high quality Turmeric fingers and Turmeric powder from India. Our Turmeric fingers are procured by our expert team from the auctions followed by careful grading & polishing to give a beautiful natural finish. The entire supply chain, everything related to Turmeric .i.e. Farmer Purchase, grading, sorting, destoning, cleaning, polishing and powder processing. We procure raw materials (Turmeric) either from the local mandis or directly from the farmers contracted by us for organic or bio-dynamic farming. The preliminary process of raw material begins with pre-cleaning process. In the pre-cleaning process, the turmeric fingers are checked & ensured by our experts that they are free from any harmful insects or pests & are grade before entering into any further processes. Then, after this pre-cleaning process, the destoner plays the function of extricating or separating if there is any metal trash or any other type of stones from the Turmeric fingers. This is done by means of air and the difference of density between them. It yields maximum returns. Then the Turmeric fingers are graded by our experts manually and are sent for the further process. There is a separate department for polishing the turmeric fingers. In this method, all the turmeric fingers are kept in one drum then they are rolled 5 to 6 hours continuously. Due to this rolling process, there is a friction between the Turmeric fingers and thus they get needed shine and also become ash-free. The capacity of one drum is 1000 Kg. After polishing of Turmeric fingers, they are sent for the grinding process. Machines are setup to carry out this process. These machines are called Pulverizers. The capacity of production is 8 tons within 20 hours/day. Metal Detector is used to maintain the quality and hygiene norms of the product even at the final stages of production besides speeding up operations. This phase of product processing and cleaning gives the assurance that the product does not contain any metal particle, which can be hazardous. The Laboratory tests ascertain the presence of pests, micro organisms, pesticide residues, etc. in the turmeric powder by a trained staff that follows ASTA methods for analysis. Standard Packing :- 50 Kgs / Nett In New Singe Jute Bags..